"SUVAT" redirects here. For the village in Azerbaijan, see Suvat, Azerbaijan. 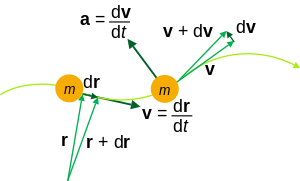 In physics, equations of motion are equations that describe the behavior of a physical system in terms of its motion as a function of time. More specifically, the equations of motion describe the behaviour of a physical system as a set of mathematical functions in terms of dynamic variables: normally spatial coordinates and time are used, but others are also possible, such as momentum components and time. 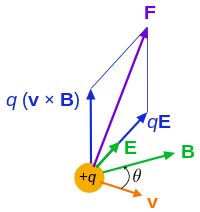 The most general choice are generalized coordinates which can be any convenient variables characteristic of the physical system. The functions are defined in a Euclidean space in classical mechanics, but are replaced by curved spaces in relativity. If the dynamics of a system is known, the equations are the solutions for the differential equations describing the motion of the dynamics. ^ Halliday, David; Resnick, Robert; Walker, Jearl (2004-06-16). Fundamentals of Physics (7 Sub ed.). Wiley. ISBN 0-471-23231-9. ^ M.R. Spiegel; S. Lipschutz; D. Spellman (2009). Vector Analysis. Schaum's Outlines (2nd ed.). McGraw Hill. p. 33. ISBN 978-0-07-161545-7. ^ Hanrahan, Val; Porkess, R (2003). Additional Mathematics for OCR. London: Hodder & Stoughton. p. 219. ISBN 0-340-86960-7. ^ Keith Johnson (2001). Physics for you: revised national curriculum edition for GCSE (4th ed.). Nelson Thornes. p. 135. ISBN 978-0-7487-6236-1. The 5 symbols are remembered by "suvat". Given any three, the other two can be found. ^ "Mechanics, D. Kleppner 2010"
^ "Relativity, J.R. Forshaw 2009"
^ R. Penrose (2007). The Road to Reality. Vintage books. p. 474. ISBN 0-679-77631-1. ^ Classical Mechanics (second Edition), T.W.B. Kibble, European Physics Series, Mc Graw Hill (UK), 1973, ISBN 0-07-084018-0. ^ C.B. Parker (1994). McGraw Hill Encyclopaedia of Physics (second ed.). p. 1199. ISBN 0-07-051400-3. ^ C.B. Parker (1994). McGraw Hill Encyclopaedia of Physics (second ed.). p. 1200. ISBN 0-07-051400-3. ^ J.A. Wheeler; C. Misner; K.S. Thorne (1973). Gravitation. W.H. Freeman & Co. pp. 34–35. ISBN 0-7167-0344-0. ^ H.D. Young; R.A. Freedman (2008). University Physics (12th ed.). Addison-Wesley (Pearson International). ISBN 0-321-50130-6. This page was last edited on 8 April 2019, at 20:26 (UTC).